This hill is part of a set of six I made for Triumph. A stand of Romans is on top to show the scale. 1. Buy MDF board at your local home improvement store and foamcore at the hobby shop. 2. Use a jig saw to cut out the hill shape, angling the blade to give it at least a 45 degree slope. The MDF hill will have a nice weight and won't slide around on the board. 3. Cut a smaller hill shape out of foamcore using an X-Acto knife. I used foamcore for the second level because I didn't feel confident cutting such a small shape with a jigsaw. Glue it to the MDF hill. 4. Sand the edges and slopes of both levels to smooth them out. 5. Use white/Elmer's glue and sand to add texture over most of the hill. 6. Base coat dark brown with craft store acrylic paints. I can add rock formations to the top to designate a steep hill. These were from the model railroad section of Hobby Lobby and with a 40% off coupon cost about $3 for a pack of four. And now it is a wooded hill. I use trees from one of those Safari tubes you can get at Hobby Lobby. They are relatively cheap, a good size for the table, don't drop flocking everywhere, and can be tossed into a box without getting damaged. Just glue them to wooden disks, drybrush and/or stain to make them look decent, texture and paint the base, and you are good to go. Great work on the scenery. I like the rock idea for steep hills. I just picked up a pack of 4 rocks too. How do figures do staying in line on the slopes of the hill? 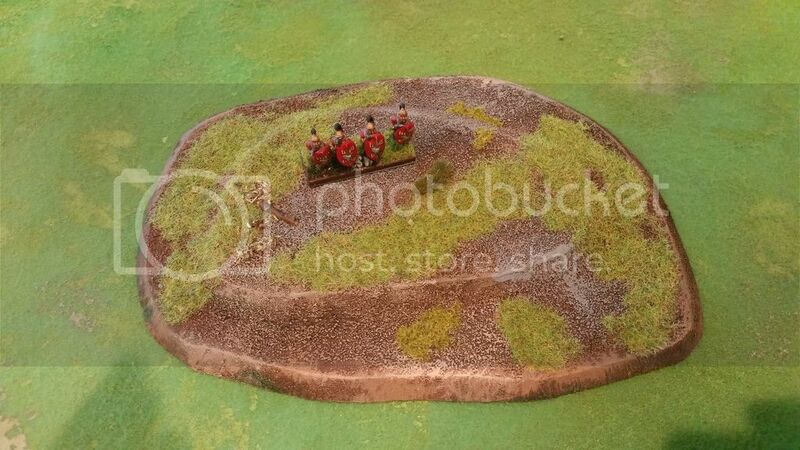 About stability of miniatures on the hills - there is no problem with 20mm or deeper bases. It is possible to get 15mm deep bases to tip over if they are placed at just the wrong angle over one of the edges. If I were doing them again, I might try to cut or sand them a little shallower. Yes, that is why I am not 100% happy with the use of 15mm deep bases, although I have been using them for my converted armies where appropriate. My old hills (which are nowhere near as nice as yours) have that problem. I have seen flat "hills" that work, but they seem wrong to me. 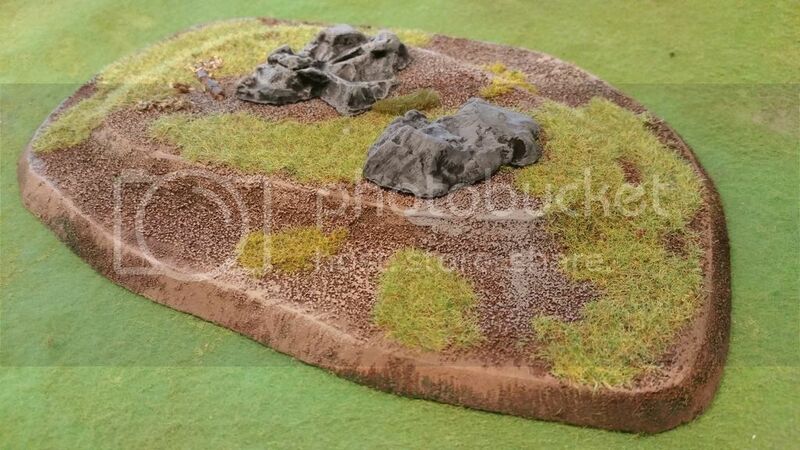 I have seen resin hills on sale at wargames shows which looked ideal, but were rather expensive, and of course, you can only buy the sizes and shapes that they offer. Considering that The Triumph! Battlefield shape and the terrain placement cards are big improvement over the legacy system, I think there is an oppprtunity to attract new gamers with better looking terrain. 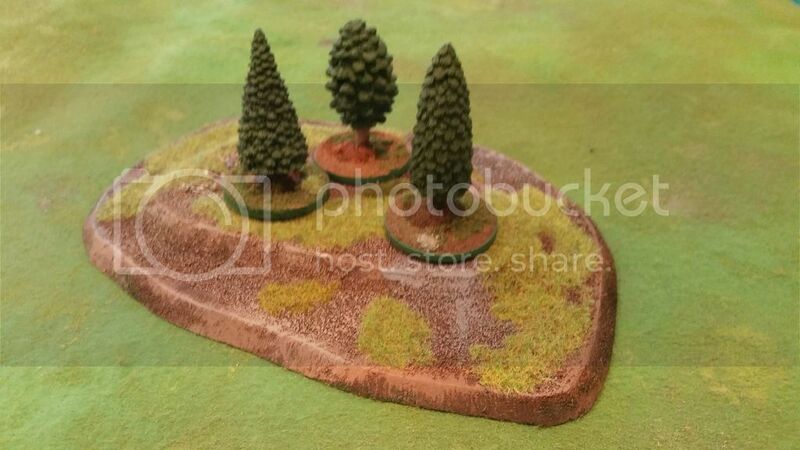 This is not to put down practical and portable felt terrain, it just doesn’t bring in new players. We are going to try terrain boards next, while we continue to make the ‘regular’ terrain better.